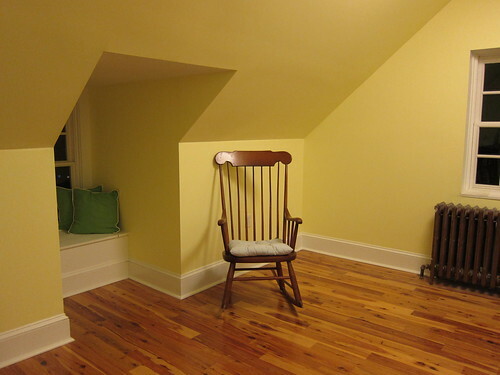 Remember how we re-did our second floor to make a larger master bedroom, bathroom and nursery? And how we decided to go ahead and pick paint and a light fixture that would as a second guest bedroom now and a nursery down the road? That built in window seat is clevery hiding some unattractive, but necessary, duct work. Woo! That’s all. You may go about your day. Okay, okay. These were supposed to be posted yesterday but life got in the way. Please pardon my tardiness. A few weeks ago I decided to participate in the adoption blogger interview project suggested by Heather at Production, Not Reproduction. I was paired with Erica, who writes at Motherhood Meets Me and Parenthood for Me. Actually, Parenthood for Me is a terrific non-profit adoption and fertility grant program that I added to our Adoption Resources page. After a long and heart-breaking battle with infertility, Erica and her husband found their path to parenthood in adoption – specifically an international program with Korea. Erica has two sons – her eldest is four and her youngest is still waiting in Korea to come home. It’s hard to imagine how she finds time to raise one boy, prepare for the homecoming of her second child, work and run Parenthood for Me. She’s one busy woman! Susan: My heart was heavy as I read about your struggles with fertility. How long after the topic of adoption was brought up before you decided to pursue it? Erica: We started looking into adoption 2 years before we actually applied to an agency. S: Do you remember the discussions being fraught with questions or did it seem right the first time you discussed it? E: We were going through infertility and doing IVF in hopes that would work. We pursued pregnancy for 3 ½ years. I had an ectopic pregnancy which was very heartbreaking. We then switched doctors and had another failed IVF. After that we decided to end all medical intervention. We wanted to be parents and if it couldn’t happen through pregnancy, we wanted to adopt. But this process took us a long time. It was a difficult time. Was there one of you who was more an advocate from the start or did you arrive at the decision at the same time? After a couple of years of trying to conceive, we both knew that parenthood was the ultimate goal. I began doing research way ahead of time. I am one of those people who like to have all the information possible. My husband wasn’t there mentally yet. However, we did make the decision together and we were both always on the same page that adoption could be in our future to build our family. In your post Adoptive Parents are Expecting Too, you discuss the sometimes insensitive comments we adoptive parents and hopeful adoptive parents hear from others. How has your reaction evolved over time? Since my son came home I have never received an insensitive comment. My son is a very outgoing and special boy. It doesn’t seem to faze people at all that he is adopted. They simply want to talk with him because he is so engaging. I’m sure people understand that our family was made through adoption but it is never brought up to us by strangers. Of the people Parenthood for Me has helped this year, is there one story that stands out to you that you’d like to share? This year we gave away 4 grants - 2 for adoption and 2 for medical procedures. The story from a 2011 grantee that stands out is when we heard of our first pregnancy. We have 4 families created through adoption from 2010-11. But we were unaware of any grantees successes due to an infertility grant. I’m so excited to learn that your second son will be home soon. What are the major differences that you’ve noticed between your two placements? Are there things that are easier this time around? Harder? We used the same agency so there aren’t many differences except that the Korea program is shutting down between the US and Korea. This is very sad news as it is the oldest international adoption program in the US. Unfortunately this time around the babies are waiting longer to come home. Min came home at 15 months and Wee will be home around 20 months. Waiting is very hard. We receive updated pictures every few months and that helps. He is very healthy and happy and we know he is being loved and well taken care of. This time it is so exciting and thrilling to see Min so happy to have is baby brother home. I cannot wait to see them together. What are some of the family traditions you practice around the holidays? Will you make adjustments this year to include Baby Wee even though he will not be home with you yet? Family traditions aren’t much different than anyone else’s. Now that min is older the holidays are even more special as he begins to understand more of what Christmas is all about. He loves to make Christmas cut-out cookies with his daddy. Since Wee may (a tiny possibility) be home this December we are focused on that. His arrival would be the best part of our holiday season. However, if he is still not here, I’m sure the grandmas will spoil him with gifts. This will help us feel like he is a part of the family even though he is not physically here yet. I did put his name on our Christmas card as he is our son and a part of our family. How are you preparing your son for the arrival of Wee? Preparation has included talking to Min a lot. Having a sibling is a big adjustment and we want him to be ready for his brother. This has also opened an opportunity for Min to put his own adoption story into perspective. Min is 4. He knows how he arrived home and where he lived for the first part of his life, but he has not yet started asking the big questions. But it will be great for Min to see Wee get off the airplane and be greeted by all of our family, because that is part of his story as well. I am so excited for Erica and her family. I hope Baby Wee joins them in time for Christmas. I’ll check back with her closer to Christmas and find out how they are doing. UPDATE (11:23 p.m.) – Read my interview on Erica’s site.